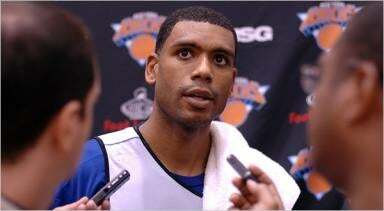 It seems like only yesterday that the New York Knicks were paying Allan Houston $20 million a year to not play for them. In fact, it was as recently as the 2006-07 season, during which Houston - who had retired in 2005 because of a arthritic left knee - was the second highest paid player in the league ($20.7 million) behind Kevin Garnett ($21 million). Of course, as Stephon Marbury has proven many times over, sometimes it's worse to pay somebody $20 mil and actually let them play. But that's another story altogether. The point is, Houston signed yet another contract with the Knicks on Thursday and will attempt a comeback with the team that made filthy rich.You might not remember this, but Houston - who's 37 years young, thank you very much - tried a comeback with the Knicks last year too. However, he didn't join the team until 10 days into training camp due to the birth of a child, and the comeback ended six minutes into one exhibition game. But Knicks president Donnie Walsh says things are, like, totally different this time. "In that case, he hadn't worked out that much. He just came in and started playing. Now, he feels like he's in better position to go out and play. I accept that." If you say so, Donnie. Walsh didn't comment as to whether the team doctors had invented a cure for "arthritic knee," and I don't know about you, but I have "limited confidence" in Houston's ability to keep pace in coach Mike D'Antoni's helter-skelter offense when a crucial leg joint is chock-full of chronic, painful inflammation. But on the bright side, D'Antoni-coached teams don't have to play defense, so maybe that'll help. I mean, it worked for Grant Hill last year, right? Rumor has it that Houston signed for the league minimum salary of $1.26 million for a player of 10 or more years of experience. Which, even if all he does is hand out Gatorade during timeouts, is a pretty sweet bargain when compared to paying him tens of millions to sit at home playing online Scrabble. Houston plans to wear number 14 in honor of his father, Wade, one of the first African-American basketball players at the University of Louisville.